Amazon, our favorite Quicken reseller, has just posted all of the new Quicken 2015 versions! You can buy and download a copy today. Be sure to also take a look at some of the user reviews. You can also find some of the older 2014 versions on sale for up to 27% off the list price. Order today and get either free shipping or instant download. If you don’t need to physical box and accompanying CD disc, then you can choose to buy the digital version that will let you download and install Property Manager 2015 right after you purchase (you’ll have up to 30 days to download from your Amazon account). No coupon codes are needed to take advantage of the sale price, just keep in mind that the deals will vary weekly and by version chosen. Save $10.00! When you use this coupon code when ordering at Intuit.com. 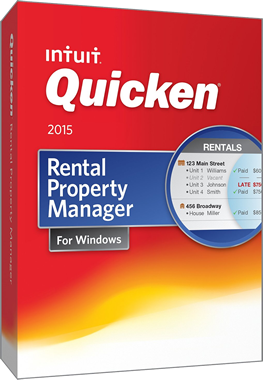 Get an extra $10.00 off on your order of Quicken Rental Property Manager or any other PC version with this instant special offer code (applies to the 2014 versions only as the 2015 editions are not yet available). This offer is expected to last through to the end of the month. $30.00 OFF! Get $30.00 off at Intuit.com with new credit card signup! No one of our favorite offers, but we haven’t seen any special offer codes to use at Intuit.com for some time now so thins may be your best deal if you would like to buy from them directly. Signup for the Intuit credit card and receive instant credit on approval as well as a $30.00 instant credit back to your card after your first purchase. Your also earn 5 points for every $1.00 spent on purchases at Quicken.com, Intuit.com, TurboTax.com or QuickBooks.com, and up to 2 points for every dollar spend elsewhere. Then for every 10,000 points, you’ll be able to cash it in for $100.00. See site for offer terms and conditions. Not everyone will qualify. Trying to get a firmer grip on your everyday financing? What about your investments or side business? Do you own a rental property? Staying this active is never easy that’s why Quicken Rental Property Manager has as objective to put all these activities together to simplify your finances and show you a clear picture of how exactly you are doing. Most of the information can be imported from your bank(s) and other financial institutions and later exported to TurboTax for tax preparation (if you choose to do it that way). Bill pay reminders, setting up bill payments, and visualization of you cash flow for better planning and avoiding dipping into the red. Track where you spend money and how much; set up spending categories and assign vendors to each of them; track how your spending fluctuates over time. Cost basis calculations and their effect on your taxes. Risk analysis of your portfolio based on parameters determined by you – your assets are compared to the ideal balance to meet your risk vs reward assumptions. Access to Morningstar ratings of different investment options. Schedule D preparation for your federal tax return. Expenses being categorized automatically as personal or business. Search for deductions and tax-deductible expenses to minimize your tax liability. Presents your business financial condition (income statement). Grants you access to quote and invoice templates. Present a simple income statement for a property/units you own to see how much you make and what you spend money on. The software helps managing the tenants by showing when the rents are due, who paid and whose payment is still pending; additionally access all tenant specific information such as security deposits, lease agreements, move-in date, contact information, etc. All the expenses are categorized and the software indicates which can be deducted for tax purposes. Prepares Schedule E related to your rental income.